A 529 plan is a special investment tool that lets you save money for yourself or someone else to go to school. If you withdraw money from the plan to spend on educational expenses, you don't pay tax on the investment earnings. Each state runs its own 529 plan, but you can invest in another state's plan even if you don't live there. The NYSaves 529 plan offers special tax incentives for New Yorkers, but other state residents can use it too. New York state offers an NYS tax deduction for its taxpayers of up to $5,000, or $10,000 for married couples, for contributions to its 529 plan. If you don't use the money for qualified educational expenses, you may face a tax penalty. A 529 education savings plan lets you set up an account to save money for someone, known as the plan beneficiary, to use for school. The money you put into the plan is taxed as usual by the federal government, but when you withdraw the money, you don't pay any additional tax on the earnings provided you use it for the beneficiary's education. The money must be used for eligible tuition and other allowed expenses like room and board, books and computer equipment. The plans are set up by the states and by the Washington, D.C., government. Different states, including New York, offer their own state tax incentives for their residents using their plans, but you can generally use a plan from any state even if you don't have any ties to that state. Different state plans offer different assortments of fees and investment vehicles available within the plan. Shop around to find one with the right investments for you, considering fees and any special tax incentives that may be offered. If you use the money for another purpose other than allowed educational costs, you will be taxed on the earnings and will owe an additional 10 percent tax penalty to the Internal Revenue Service. The plans are designed to incentivize people to save money for their children's college or university tuition. You can open a plan for anyone, including yourself, and it is possible to change the beneficiary on a plan once it's established, although there may be tax consequences for doing so. Multiple people can open plans for the same beneficiary. If you contribute more than $15,000 to a 529 plan for someone else in a year, you may be subject to federal gift tax. The New York state 529 plan offers a variety of investments with different levels of risk and reward. It also offers a tax incentive for investors to put money into a 529 plan. Single taxpayers and married people filing separately can deduct up to $5,000 in 529 plan contributions per year from their state taxable income, and married couples filing jointly can deduct up to $10,000 per year. This tax incentive doesn't apply to your federal income tax, where you don't receive any deduction for 529 plan contributions. You can put more money into the 529 plan in a year, but you won't get to deduct it from your tax. If you don't use the money for educational expenses, or you use it to pay for elementary or secondary school tuition rather than postsecondary programs like a college or university, you may have to pay the tax deduction back to New York. If you move the money to another state's plan, you may also have to pay the tax break back to New York. Keep in mind that if you leave New York, you don't have to move the money in your New York 529 plan to another state's plan unless you wish to do so. You can set up automatic paycheck contributions to the New York plan if your employer's payroll system supports it, and you can also contribute by check or set up one-time or recurring electronic contributions. Ordinarily if you give more than $15,000 to one person in a particular year, that money can be subject to federal gift tax payable by the giver. This is true of setting up a 529 plan on someone else's behalf as well, although you are allowed to make a one-time $75,000 payment, provided you don't give the same beneficiary any more gifts in a five-year period. Essentially, you are allowed to give five years' worth of gifts tax-free in one year provided you do so through a 529 plan. If you are setting up 529 plans for multiple people or otherwise giving gifts to multiple people, the $15,000 limit applies separately for each recipient. Another type of 529 plan is a prepaid college tuition plan. These allow you to prepay for a student's college, essentially paying today's rates for future education rather than paying the likely higher prevailing price when the student actually attends. Some states offer a prepaid tuition plan for their state university systems, although New York is not among them. There is also a private college 529 plan that lets you prepay for any of hundreds of participating private colleges. You can generally get a refund of the prepaid tuition if the student you're saving for doesn't actually attend a qualifying school, though you may not earn as much after doing so as you would have by investing the money in something else. Make sure you understand the terms of such a plan before you begin contributing. Money held in and disbursed from 529 plans can affect your eligibility for financial aid. Generally, money disbursed from a parent-owned or student-owned 529 plan doesn't count as income for financial aid purposes. However, the money in the plan can be considered part of the student's assets or parent's assets for financial aid purposes. The plan will be disclosed when you fill out the Free Application for Federal Student Aid, or FAFSA, and other school-specific financial aid forms. If someone else, like a grandparent, owns the plan, the money taken out of it will ordinarily count as income to the student for financial aid purposes. This may reduce your eligibility for additional financial aid, depending on your circumstances and your college. Some schools may have their own rules about financial aid that will make money in a 529 plan be handled slightly differently. Contact your school for information about the system it uses for evaluating financial aid decisions. 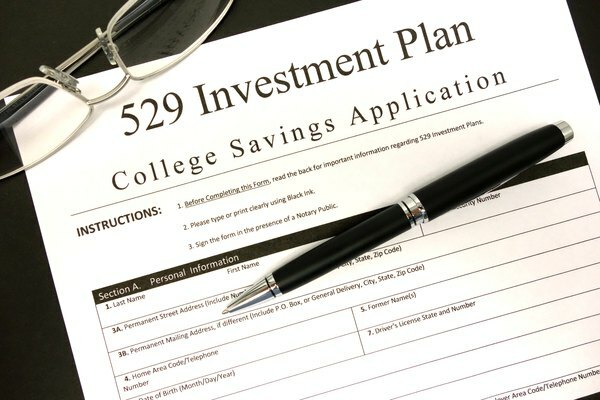 You can generally rollover the money in a 529 plan, meaning transfer it from one 529 plan to another, once a year without any federal tax penalty. Work with the plan administrators to do this directly so that you don't actually take possession of the money yourself and incur any tax liability. Keep in mind that if you received a tax deduction from New York for contributing to its plan, you will likely have to pay the deduction back if you roll the money in the plan into another state's plan. Consider this penalty as part of the process when you're deciding whether or not to roll money from one plan into another. Saving for College: Does a 529 Plan Affect Financial Aid?